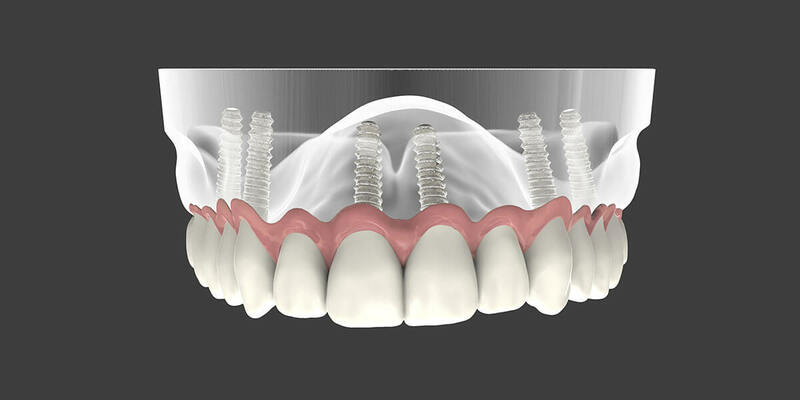 Dental implant supported dentures can be either fixed or removable. This solution requires the placement of two or more implants. If a removable denture is selected, the denture will “snap” on to the implant rather than requiring the use of denture paste or adhesives. Removable dentures can be taken out for cleaning at night. This technique offers many advantages over traditional dentures. Easy to care for, this solution can simulate the look and feel of natural teeth and stay fixed in place with the implants acting as anchors. Patients will not experience the typical rocking and movement or gum irritation associated with dentures. Dental implant placement can also help alleviate the sunken look that can occur with bone loss in the jaw by stimulating bone growth in the area around the implant. This process is called osseointegration and can also help prevent future bone loss.